The Muker area is one of the best places to see upland hay meadows from public footpaths in the Yorkshire Dales. Some of the meadows at Muker are protected as part of the Muker meadows Site of Special Scientific Interest (SSSI) and the Northern Pennine Dales Meadows Special Area of Conservation (SAC). They are species-rich with a very wide range of wildflowers and grasses including Wood Crane’s-bill, Melancholy Thistle, Yellow Rattle, Pignut, Lady’s Mantles, Rough Hawkbit, Cat’s-ear and Sweet Vernal Grass. Four meadows at Muker were named as one of 60 Coronation Meadows in 2013 by HRH The Prince of Wales. These meadows are celebrated as the surviving “jewels in the crown”, places where people can enjoy the riot of colour and abundance of wildlife. They are also used as ‘donor’ meadows to provide seed for the restoration of new meadows in the same area. Find out more about how hay meadow restoration works. 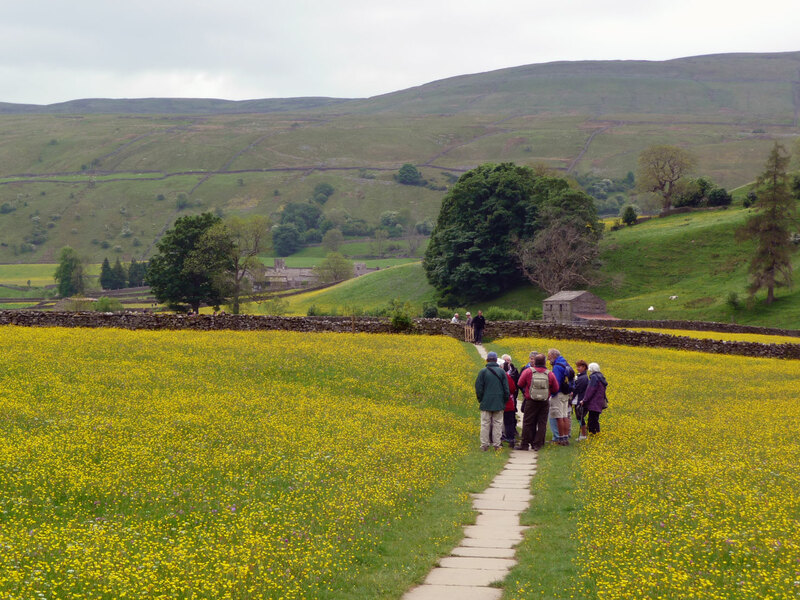 A flagged footpath from the nearby village of Muker enables summer visitors to experience the colours, sounds and scents of the meadows and a quintessential aspect of the Dales. Species to spot: Wood Crane’s-bill, Melancholy Thistle, Yellow Rattle, Pignut, Lady’s Mantles, Rough Hawkbit, Cat’s-ear and Sweet Vernal Grass. Help save our precious wildflower meadows. Give a Living Bouquet wildflower gift for only £25.